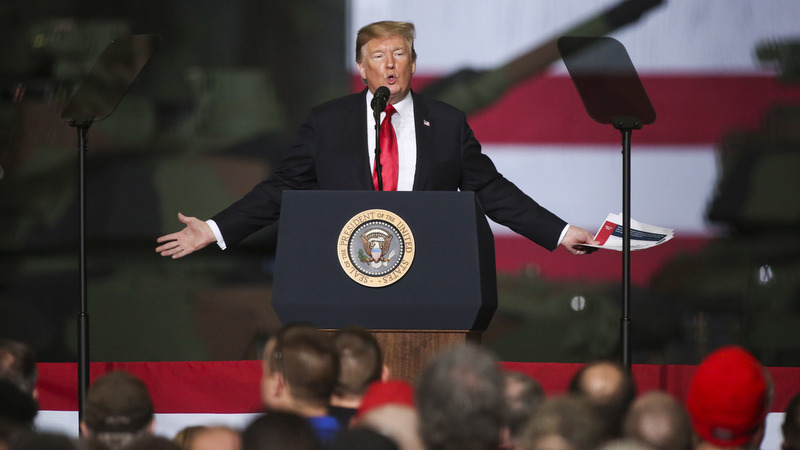 "I gave him the kind of funeral that he wanted, which as president I had to approve," Trump told a crowd at an Army tank manufacturing plant in Lima. "I don't care about this. I didn't get [a] thank you. That's okay. We sent him on the way, but I wasn't a fan of John McCain." Trump was the only living president not to attend McCain's September 2018 service at the National Cathedral, during which several speakers made not-so-veiled comparisons between the current commander-in-chief and the 2008 GOP presidential nominee who had been tortured for over five years after his plane was shot down over Vietnam. McCain's daughter Meghan said during her emotional eulogy that "the America of John McCain has no need to be made great again because America was always great" — an allusion to the president's campaign slogan. The two never reconciled, and the following summer McCain would announce he had been diagnosed with brain cancer. Shortly after that, the Arizona senator returned to the Senate in August 2017 to cast a "no" vote against the GOP's plan to repeal the Affordable Care Act, which Trump still sees as the ultimate betrayal and mocks McCain for. He often dramatically re-enacted the senator's emphatic thumbs down on the Senate floor during rallies, even as McCain was ongoing treatment. Instead, the Georgia senator suggested waiting for the recommendations from a group considering how to best honor McCain, which includes his widow Cindy and his children.